It's official! I've now heard it all. So not only is George Zimmerman responsible for Trayvon's death but the manner in which he was dressed is just as responsible as well. You know, because there is nothing more gangsta than wearing a hoodie. Nevermind that all people wear hoodies, just please know that if you are black or latino, white folks maybe prone to busting a a cap in your behind because to them you are a gangsta at least that is what Geraldo Rivera is saying. On Friday morning, Rivera said that he had a "different take" on the case than most other people. He said that he believed George Zimmerman should be "investigated to the fullest extent of the law" and "prosecuted" if criminally liable, but blamed Martin's parents for letting him go outside wearing a hoodie. "But I am urging the parents of black and Latino youngsters particularly to not let their children go out wearing hoodies," Rivera insisted. "I think the hoodie is as much responsible for Trayvon Martin’s death as George Zimmerman was." When asked to clarify his remarks, Rivera said that he cautioned his own son against wearing hoodies. He explained, "When you, when you see a kid walking — Juliet — when you see a kid walking down the street, particularly a dark skinned kid like my son Cruz, who I constantly yelled at when he was going out wearing a damn hoodie or those pants around his ankles. Take that hood off, people look at you and they — what do they think? What’s the instant identification, what’s the instant association?" "Uh-oh," remarked co-host Steve Doocy, who nodded in agreement. Rivera argued that avoiding certain types of attire was a necessary deterrent against racial profiling. "It’s those crime scene surveillance tapes. Every time you see someone sticking up a 7-11, the kid is wearing a hoodie," Rivera said. "You have to recognize that this whole stylizing yourself as a gangster, you're gonna be a gangster wannabe? Well, people are gonna perceive you as a menace." He stressed that Martin was an "innocent" and "wonderful" kid who "didn't deserve to die." However, he reiterated, "I'll bet you money, if he didn't have that hoodie on, that nutty neighborhood watch guy wouldn't have responded in that violent and aggressive way." So today is a rainy day and I'm headed to the gym without the nuisance of an umbrella. What will I wear? Hmmmm. A hoodie...what a novel idea! Yeah and afterwards to block the cooler breeze on my head and neck after my workout the hoodie will come in handy. Oh but wait, I'm inviting somebody to shoot me. After all it was a rainy day that an unarmed teenager decided to practically use his hoodie to keep from getting wer and that led to him being killed. 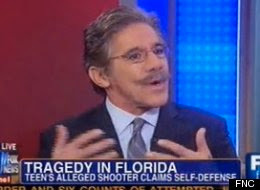 Geraldo needs to shut up with that garbage. It's called body language and it evolved in our species long before people could talk and there were blacks and whites. Your subconscious (primitive) brain reads these signals in milliseconds as a survival instinct. At first impression, hiding your face will immediately be perceived as a sign of deceit by others no matter what your color. Your conscious mind can later determine they are only trying to keep warm, but if it's nice weather you'll be suspicious.